Turkey deepened its foothold in Syria Sunday, Oct. 16, with the capture from the Islamic State of the small but highly emblematic town of Dabiq in the north by a Syrian rebel group backed by Ankara. Dabiq is important in the Salafist ritual; it was there, that ISIS vowed to stage the last apocalyptic battle between the Muslims and the infidels. In the context of President Tayyp Erdogan’s grand scheme of things, Dabiq represented the first direct victory of a pro-Turkish group over ISIS, and it came, significantly, just before the US-Iraqi-Kurdish offensive was launched on Oct. 17 to drive the Islamists from Mosul. But most of all, Erdogan showed the world he would have no qualms about sending the Turkish army and Turkish-trained Syrian and Iraqi militias into battle – over strong objections from Washington and Baghdad, thereby imposing his will on the two war arenas. Neither did he have any compunction about dusting off the historical 1923 Treaty of Lausanne which ended World War I and defined the borders of modern Turkey. In order to legitimize his grab for territory on both northern Syria and Northern Iraq, Erdogan castigated this seminal document as being the result of colonial blackmail by foreign powers, which forced Turkey to give up vast tracts of territory once ruled by the defunct Ottoman Empire. The tracts unjustly ripped from Turkey by the treaty are located, according to Erdogan, in present-day northern Syria and northern Iraq. On Tuesday, Oct. 11, he dismissed Prime Minister Haider al-Abadi’s demand to withdraw the Turkish troops he had planted at the Iraqi Bashiqa base, on hand for jumping into the coming Mosul offensive. The Turkish president’s aggressive push for land and influence has been strongly empowered by his rapprochement with Russian President Vladimir Putin and the secret deals they struck during Putin’s visit to Istanbul on Oct. 15, his third trip to Turkey in two months. That day, debkafile exclusively disclosed the pair’s demarcation of a Turkish “security zone” inside northern Syria, coupled with a ban on all over-flights, barring those of Russia and Turkey, and a destination for the intake of refugees from Syrian war zones, primarily Aleppo. The significance of Erdogan’s self-elevation to senior patron of the Syrian rebel movement (barring Al Nusra and other Islamist groups) is not fully appreciated in the West. He bought it by granting Moscow permission to deploy an advanced integrated air defense system in Turkey, so becoming the first NATO power to host a Russian missile shield. Overall, the new Putin-Erdogan understandings have opened the door for Turkey to expand into Syria and Iraq. 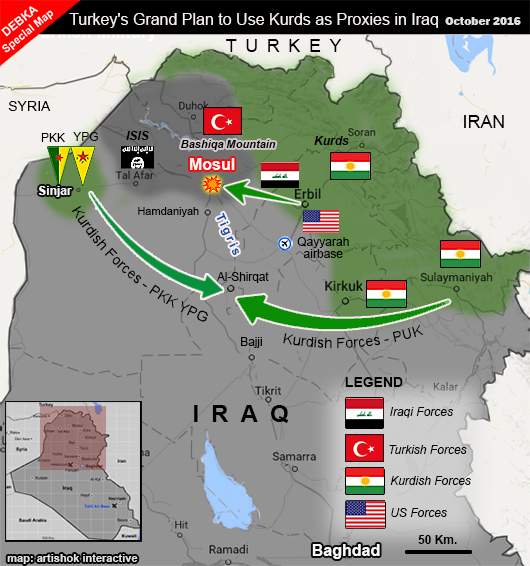 The Turkish ruler’s dogged drive for a military role in the US-led assault on Mosul – in the teeth of US and Iraqi opposition – will also open a doorway for Russia too to establish a foothold in northern Iraq. The third party standing to gain is Iran, which holds powerful levers in Baghdad – both with Iraq’s Shiite Prime Minister Al-Abadi and the Shiite majority in Iraqi government forces that are fighting in the battle for Mosul. Those soldiers’ loyalties are far from clear-cut. Therefore, in the course of the battle for Mosul, the United States may find itself abruptly up against an adversarial Iraqi-Turkish-Iranian bloc, backed from Syria by Moscow in unexpected ways. DEBKA Weekly’s sources would not be surprised to see Russia, after elbowing the Americans out of positions of influence in Syria, repeating the exercise in Iraq. Tehran would go along with any maneuver that promised Iran an open land bridge to the Mediterranean via Syria and Iraq.